Certain Women is a 2016 American drama film edited, written, and directed by Kelly Reichardt. Based on three short stories from Maile Meloy's collections, Half in Love and Both Ways Is the Only Way I Want It, the film stars Laura Dern, Kristen Stewart, Michelle Williams, Lily Gladstone, James Le Gros, and Jared Harris. The film, which had its world premiere at the 2016 Sundance Film Festival on January 24, 2016, was released theatrically in the United States on October 14, 2016, by IFC Films and grossed $1,068,054 domestically, becoming the director's highest-grossing film to date. Lawyer Laura Wells has been dealing with a disgruntled client, Fuller, for eight months. Out of work after a work place injury caused a disability, he has taken to visiting Laura repeatedly at her office. As Fuller will not listen to her advice, she takes him to another lawyer. After assessing the case, the lawyer tells Fuller exactly what Laura had told him; that while Fuller's company was clearly at fault for his injuries, Fuller can no longer sue the company, because he previously had accepted their initial small settlement. On his way home from the meeting with the second lawyer, Fuller feuds with his wife, and is kicked out of their car. He takes a ride home with Laura Wells. On the way he tells Laura that he wants to shoot his former employers. Late that same night, Laura is called by the police. Fuller has gone back to his former place of employment and has taken a security guard as hostage. After being prepped by the police, Laura agrees to talk to Fuller. She goes into the building and finds Fuller with his hostage; Fuller has her locate his employee records, which include the case file that the company used to settle his disability claim. Fuller has Laura read the entire file, which details clearly how Fuller was cheated out of his rightful settlement. Fuller decides to let the guard go; He asks Laura to stall for him by going to the front and telling the police of his demands as if he has a gun pointed at her, while he slips out the back. Instead, Laura immediately tells the police where Fuller is and he is arrested. Gina and Ryan Lewis are a married couple with a teenage daughter, building their own home from the ground up. Gina feels that Ryan constantly undermines her with their daughter and is annoyed by his behavior. On their way home from the campsite of their new home, they decide to stop at the home of Albert, an elderly man they know, to try to persuade him to sell them the sandstone on his property. As they talk, Gina tries to persuade Albert to sell her the sandstone, but he interrupts her repeatedly and seems only interested in talking with Ryan. Eventually Albert tentatively agrees to give the sandstone to Gina and Ryan. Gina, who has been secretly recording the conversation, signals that they should leave. In the car on their way home, she finds it ridiculous how easily she was able to obtain the sandstone. Sometime later, Gina and Ryan arrive and load up a truck full of the sandstone. She notices Albert watching from his window and waves at him but he does not wave back. Jamie is a ranch hand living in isolation during the winter, tending to horses on a farm outside Belfry. Heading into town one night, she sees cars turning into the school and follows them. She learns that she has stumbled onto a class on school law taught by a young lawyer, Beth Travis. Jamie goes out to eat with Beth after class. Beth explains that she lives in Livingston, which is a four-hour drive away, so she must make the eight-hour round trip twice a week to make it back in time for her real job. Despite having no interest in education law, Jamie returns to class week after week. One week she brings one of her horses to class, and she and Beth ride the horse to the diner. The following week, she is stunned when she learns Beth has quit and a new teacher is brought in as a permanent replacement. Jamie then immediately leaves the class and drives straight to Livingston. Spending the night in her car, she spends the morning driving to law offices hoping to find Beth. On the way, she has flashbacks of the previous time she drove to the city. Locating her address, Jamie sees Beth in the parking lot, and tells her that she drove over knowing that if she didn't, she would never see her again. Beth fails to respond and Jamie leaves abruptly. On her way home, she falls asleep at the wheel and drives into an empty field. Some time later, Laura visits Fuller in prison. He says he understands how she acted and asks her to answer his letters just so as not to feel so lonely. She agrees. Gina has a barbecue with friends at her land and her husband appreciates her work. She looks at the sandstone and smiles. Jamie continues working at the ranch. Reichardt had shot most of her feature-film work in Oregon and wanted a change of setting. She intertwined three of Meloy's short stories, set in Montana, and after scouting locations, felt that Livingston, rather than Meloy's home town of Helena was ideal for the look of the film. The production team included Neil Kopp and Vincent Savino with Todd Haynes as executive producer. The principals, including two-time collaborator Michelle Williams, were cast in 2015. Haynes notes that the shots in Certain Women compartmentalize the women's lives—the isolation and loneliness they feel—in spite of the fact that each story deals with relationships. Reichardt visually accomplishes this by emphasizing door-frames, windows, mirrors and architectural structures to fragment her characters within the frame. Reichardt uses location sounds throughout the film, incorporating wind and train whistles into the sound design. There's only one scene that uses a film score. Certain Women had its world premiere at the 2016 Sundance Film Festival on January 24, 2016. Shortly after, IFC Films acquired U.S distribution rights to the film. Prior to the films premiere at Sundance, Sony Pictures Worldwide Acquisitions acquired international distribution rights to the film. The film went onto screen at the Toronto International Film Festival, the New York Film Festival, and The Art of Brooklyn Film Festival. The film was released on October 14, 2016. The film received critical acclaim upon its Sundance premiere. Rotten Tomatoes lists the film as "certified fresh" and rates it 92% out of 162 reviews posted, with an average score of 7.8 out of 10. The website's critical consensus reads, "Certain Women further demonstrates writer-director Kelly Reichardt's gift for telling the stories of ordinary people with uncommon empathy and skill." On Metacritic, the film has a score of 81 out of 100, based on 35 critics, indicating "universal acclaim". Noel Murray at The Playlist graded it an A- and called the film "utterly enthralling" while praising the "mesmerizing effect" of the slow pacing. Guy Lodge raved about the film with particular praise for director Reichardt whom he called the "quietest of great American filmmakers". A reviewer for The Guardian gave the film 4 out of 5 stars and praised Reichardt as "a master at slow-burning, melancholic dramas". Leslie Felperin at The Hollywood Reporter was more mixed on the film praising the final section of the film as an "exquisite tale" and especially enjoying "luminous newcomer" Lily Gladstone but called the film as a whole "a trifle academic and dry". In France Les Cahiers du cinéma placed the film third on their 2017 Top Ten chart (just after Twin Peaks (2017 TV series) and Jeannette: The Childhood of Joan of Arc). ^ "Certain Women (12A)". British Board of Film Classification. November 7, 2016. Retrieved November 8, 2016. ^ Bills, Arina (January 19, 2016). "Movie filmed in Livingston selected for Sundance Film Festival". Bozeman Daily Chronicle. Retrieved July 17, 2016. ^ "Certain Women". Box Office Mojo. IMDb. Retrieved November 20, 2016. ^ Reichardt, Kelly (Director) (2016). Certain Women (Motion picture). U.S.: Reichardt, Kelly; Haynes, Todd. DVD interviews. ^ Kroll, Justin (February 17, 2015). "Michelle Williams Reteams With Kelly Reichardt on Untitled Drama (EXCLUSIVE)". Variety. Penske Business Media. Retrieved November 19, 2015. ^ "Certain Women". Sundance Film Festival. The Sundance Institute. Retrieved July 18, 2016. ^ "Sundance Institute Completes Feature Film Lineup For 2016 Sundance Film Festival". Sundance Film Festival. The Sundance Institute. December 7, 2015. Retrieved July 18, 2016. ^ Zumberge, Marianne (March 9, 2016). "IFC Films Acquires Kristen Stewart-Michelle Williams Drama 'Certain Women'". Variety. Penske Business Media. Retrieved July 18, 2016. ^ McNary, Dave (April 16, 2015). "Sony Buys Kelly Reichardt Drama Starring Kristen Stewart, Michelle Williams". Variety. Penske Business Media. Retrieved July 18, 2016. ^ Vlessing, Etan (August 16, 2016). "Toronto: Christian Bale-Starrer 'The Promise,' Richard Gere-Starrer 'Norman' Get Gala Screenings". The Hollywood Reporter. Prometheus Global Media. Retrieved August 30, 2016. ^ "Certain Women". Toronto International Film Festival. Retrieved August 30, 2016. ^ "Main Slate". New York Film Festival. Film Society of Lincoln Center. Retrieved August 30, 2016. ^ "Certain Women". New York Film Festival. Film Society of Lincoln Center. Retrieved August 30, 2016. ^ "Kelly Reichardt's Powerful Drama 'Certain Women' To Open 7th Annual Art of Brooklyn Film Festival". The Art of Brooklyn Film Festival. May 8, 2017. Retrieved June 25, 2017. 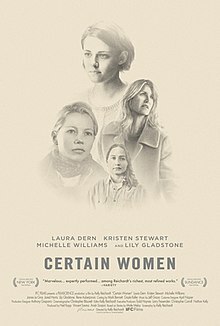 ^ "Certain Women". IFC Films. Retrieved July 18, 2016. ^ "Certain Women (2016)". Rotten Tomatoes. Fandango. Retrieved June 26, 2018. ^ "Certain Women Reviews". Metacritic. CBS Interactive. Retrieved September 25, 2016. ^ Murray, Noel (January 25, 2016). "Sundance Review: Kelly Reichardt's 'Certain Women' Starring Michelle Williams, Kristen Stewart, And Laura Dern". The Playlist. Penske Business Media. Retrieved January 25, 2016. ^ Lodge, Guy (January 24, 2016). "Sundance Film Review: 'Certain Women'". Variety. Penske Business Media. Retrieved January 25, 2016. ^ Smith, Nigel M. (January 25, 2016). "Certain Women review: Kelly Reichardt returns melancholy yet triumphant". The Guardian. Guardian News and Media. Retrieved January 25, 2016. ^ Felperin, Leslie (January 24, 2016). "'Certain Women': Sundance Review". The Hollywood Reporter. Prometheus Global Media. Retrieved January 25, 2016. ^ "Top Ten 2017". Cahiers du cinema. Retrieved June 26, 2018. ^ McCue, Michelle (December 16, 2016). "'Arrival', 'La La Land', 'Hell or High Water' Among The Nominees for the 2016 AWFJ EDA Awards". We are Movie Geeks. Lanier Media. Retrieved December 17, 2016. ^ Shanley, Patrick (December 11, 2016). "'La La Land' Named Best Picture by Boston Society of Film Critics". The Hollywood Reporter. Prometheus Global Media. Retrieved December 11, 2016. ^ FFCC (December 21, 2016). "'Moonlight' leads 2016 Florida Film Critics Awards Nominations". Florida Film Critics Circle. Retrieved December 21, 2016. ^ Cox, Gordon (October 20, 2016). "Gotham Awards Nominations 2016: 'Manchester By The Sea' Leads with Four". Variety. Penske Business Media. Retrieved October 20, 2016. ^ Warren, Matt (November 22, 2016). "2017 Film Independent Spirit Awards Nominations Announced!". Independent Spirit Awards. Film Independent. Retrieved November 22, 2016. ^ Greene, Steve (December 19, 2016). "2016 IndieWire Critics Poll: Full List of Results". IndieWire. Penske Business Media. Retrieved December 27, 2016. ^ "60th BFI London Film Festival announces 2016 awards winners" (Press release). British Film Institute. October 17, 2016. Retrieved October 18, 2016. ^ "42nd Annual Los Angeles Film Critics Association Awards". Los Angeles Film Critics Association. Retrieved December 5, 2016. ^ nsfc2017 (January 7, 2017). "Awards for 2016". National Society of Film Critics. Retrieved January 7, 2017. ^ "2016 Awards". New York Film Critics Circle Awards. New York Film Critics Circle. Retrieved December 1, 2016. ^ "2016 San Diego Film Critics Society's Award Nominations". San Diego Film Critics Society. December 9, 2016. Retrieved December 9, 2016. ^ "San Diego Film Critics Society's 2016 Award Winners". San Diego Film Critics Society. December 12, 2016. Retrieved December 12, 2016. ^ Flores, Marshall (December 9, 2016). "San Francisco Film Critics Circle Nominations!". Awards Daily. Retrieved December 10, 2016. ^ Nordyke, Kimberly (December 12, 2016). "'Moonlight' Named Best Picture by San Francisco Film Critics Circle". The Hollywood Reporter. Prometheus Global Media. Retrieved December 12, 2016. ^ "2016 StLFCA Annual Award Winners". St. Louis Gateway Film Critics Association. December 18, 2016. Retrieved December 12, 2016. ^ Berger, Laura (December 19, 2016). "Women Film Critics Circle Nominations: "Hidden Figures," "13th," & More". Women And Hollywood. Retrieved December 15, 2016. This page was last edited on 10 December 2018, at 10:21 (UTC).